Argonia-Attica has played the No. 6 strength of schedule in the classification, while Sedan has faced No. 43, according to Prep Power Index. PPI ranks the two teams less than a point apart from each other despite the records difference. A&A has lost three games to Caldwell, Udall and South Central by an average of 14.7 points. Sedan lost 64-32 to Cedar-Vale Dexter in Week 5. The only other time the teams have matched up was a 56-12 A&A win in 2015. A&A senior Masen McDaniel has accounted for 12 scores, while senior Blake Harnden has 14 rushing TDs. McDaniel has 83 tackles and seven sacks, while Harnden has three interceptions. For Sedan, junior Tayte Halderman has delivered 793 rushing, 423 passing and 15 scores. Standout running back Cody Joslin, a 1,000-yard back last year, has been limited this season and missed multiple games. Coach Matt Fowler, who built Spearville into a state power, has delivered a massive turnaround at Oswego with his single wing. The Indians, in their first season of eight-man football, have a five-win improvement after five wins in the previous three seasons. Udall, 5-5 last year, has had a big year from senior Josh Fielder. He has passed for 402 yards and five scores and rushed for 1,160 yards and 24 rushing TDs. Junior Trevor Whiteman has picked off six passes. Oswego has heavily relied on non-seniors at the skill positions, and junior Jace Wilson has rushed for 1,239 yards and 19 scores. This is believed to be the first all-time meeting between the teams. Madison, one of the year’s surprises, has already had a three-win improvement under third-year coach Alex McMillian and improved its record for the fourth straight fall. Madison, led by a deep group that includes senior Austin Watts and sophomores Hunter Engle and Nasun Wasson, has permitted just 80 points, fourth-best in Division I, and won the Lyon County League. Peabody-Burns has enjoyed a one-win improvement from last year but has allowed 47 points a contest. One of the more highly anticipated first-round matchups, these two teams each rank in the top-four in Division I in scoring. Maranatha has 416 points and achieved a four-win improvement and the first winning season since 2013. The Eagles had six wins in the last four falls. Solomon has tallied 412 points and took an upset loss to Canton-Galva two weeks ago. The Gorilllas have allowed 124 points, Maranatha 166. For the Eagles, junior quarterback Nate Burdette has 1,478 passing yards with a 33/8 TD/INT ratio and has rushed for 589 yards and 11 scores. Junior Brock West has 58 catches for 1,183 yards and 29 TDs. He has tied the eight-man state record of 29 receiving scores set by Kellye Irvin of McCracken in 1979, according to the Kansas Sports Hall of Fame. For Solomon, senior quarterback Braden Neilson has passed for 602 yards, rushed for 673 and accounted for 30 scores. Senior Logan Krause leads the Gorillas with 871 yards rushing and 18 scores. South Central, 25-5 in the last three seasons, again has one of the top defenses in eight-man with just 92 total points allowed against the No. 8 strength of schedule in the classification. South Central, fifth-ranked in scoring defense in Division I, has plenty of depth with juniors Chayde Snyder, Gage Girk and Eli Jellison leading the team in tackles. Girk is one of the state’s top specialists and Snyder, in his third season as the starting quarterback, has accounted for 21 scores. Sophomore Brogan Myers has more than 1,100 rushing yards for Cedar Vale-Dexter. This is the first-ever meeting between the schools. Caldwell has tallied 358 points, while Central Burden has scored 350. However, Caldwell has permitted just 152, and Central Burden 236. Caldwell defeated Medicine Lodge in Week 8 to qualify for the postseason in highly challenging District 2 where five teams finished .500 or better. Caldwell outgained Medicine Lodge, 356-314, and had a pair of key interceptions. These teams have played each other year since ’08 with Caldwell holding a 7-3 edge, including winning four of the last five. Central Burden’s Clayton Cook is a strong running back and a load to bring down at 6-foot-1, 225-pounds. Canton-Galva, possibly the classification’s biggest surprise, had seven wins in the previous three years. This fall, with no seniors under alum and second-year coach Shelby Hoppes, the Eagles have their most wins since 2006. Canton-Galva and Lebo have never played each other. 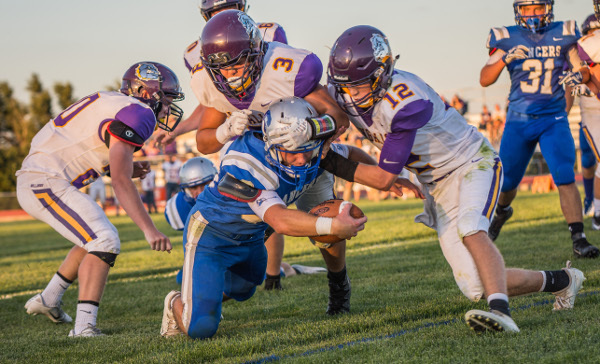 Canton-Galva quarterback Landon Everett has cleared 1,000 rushing yards and wide receiver/free safety Tyson Struber has emerged as one of the state’s top freshman. Lebo is 8-4 since a 0-5 start last fall. Devan McEwen is the Wolves’ dual-threat quarterback throwing for 1,231 yards and 18 touchdowns, while rushing for seven more scores. Avery Peek is Lebo’s leading receiver with 54 catches for 674 yards and 12 scores. Bennington is 11-6 in the last two seasons. Senior J.T. Ohlson has passed for 761 yards with a 15/3 TD/INT ratio. He leads the team with 522 rushing yards and 10 scores for a unit that has averaged 4.9 yards per carry. Junior Javon Allen has played well in all three phases with 1,217 all-purpose yards and six kick return TDs on just 10 attempts. That ties the all-time eight-man team record set by multiple teams, last by Haviland in 1999, according to KSHOF records. Burlingame had its 33-game regular season winning streak end with a 26-24 loss to Madison two weeks ago. Burlingame has its three senior standouts in quarterback Montana Giffin (25 TDs accounted for), running back Seth Greenwood (1,025 rushing yards, 27 total scores) and senior Keller Snesrud (five TFLs). Central Plains is heavily favored in the first matchup between the teams since the 2011 playoffs when South Gray beat the Oilers, 52-6, en route to a state runner-up finish. Central Plains has posted five consecutive seasons with nine or more wins. The Oilers have shut out six straight opponents and lead Kansas with just 22 points permitted. Central Plains quarterback Myles Menges has thrown for 746 yards with a 16/3 TD/INT ratio. Senior Grant Heldstab has recorded 82 tackles, 11.5 for loss to lead the Oilers. South Gray has taken a four-win drop after a 7-2 season last fall. Rebel senior quarterback Austin Jantz has 699 passing yards, 660 rushing with 13 total scores. This game matches two of the best passing quarterbacks in eight-man football with Macksville’s Kody Mead and Ness City’s John Pfannenstiel. Mead has thrown for 1,190 yards with a 23/5 TD/INT ratio and rushed for 290 yards and nine scores. Pfannenstiel had seven touchdowns in a Week 7 win, and then engineered a 20-point comeback with four total scores last week in a 28-26 win versus then-No. 2 Hodgeman County. Ness City standout tight end/defensive end Andres Rios suffered a knee injury in the contest. Edwin Rodriguez had 28 tackles and an interception, while Angel Guzman had 22 stops and Easton Seib recorded 20 in the win. This is a rematch from a 50-28 Ness City win in Week 2 this year. The Eagles have won six of the last seven in the series. WaKeeney-Trego has a two-win improvement from last year, while Clifton-Clyde has a one-victory bump from 2017. Clifton-Clyde is heavily favored after the Eagles easily dispatched high-octane Hill City this season, a team WaKeeney lost to by 30. Trego senior Dallas Schneider has had a big season with 841 rushing and 12 scores, along with four special teams touchdowns. Senior running back Drake Steinbrock and senior lineman Nathan Ohlde are multi-year accomplished starters for Clifton-Clyde. Hoxie, the defending state champion and ranked No. 1 most of the year, took a surprise loss to undefeated St. Francis, 64-30, in Week 5. The Indians have averaged 49.5 points a contest but permitted an uncharacteristic 19.5 points a game. Last season, Hoxie scored 44.8 points a game and permitted nine. Junior Wylie Weems has rushed for 979 yards and 14 scores, while senior quarterback Jared Kennedy has accounted for 23 scores. Weems and Logan Weimer have both picked off four passes. Hill City has tallied 48 points a contest but permitted 31.3. The Ringnecks have posted back-to-back winning seasons for the first time since ’08-10. Senior quarterback Conner Born has had an exceptional season with 736 passing, 1,076 rushing and 32 scores accounted for. Hoxie has won five straight in the series since 2011. Hodgeman County took the upset road loss, 28-26, in the final seconds to Ness City last week. However, the Longhorns, the defending Division II state runners-up, have put together a great resume versus the No. 7 SOS in Division I with wins against South Central, Medicine Lodge, Dighton and Spearville. Junior Eli Salmans has 177 carries for 1,253 yards and 15 scores, while his brother, sophomore quarterback, Isaac, has 883 passing, 700 rushing and 28 scores accounted for. Moundridge is in its first-year of eight-man football. Last week, the Wildcats pushed Little River (7-1) before falling 48-46 on a Redskin touchdown with five seconds left. Cody Hazleton rushed for 328 yards, scored five touchdowns, and registered 16 tackles for Moundridge in the loss. Spearville has posted another solid season under first-year coach Travis Callaway. Senior Kolby Stein has 422 passing yards with a 5/1 TD/INT ratio, along with 672 rushing yards and 15 scores. Junior Carson Rich has 605 rushing yards and 10 TDs. Spearville has averaged 5.9 yards per carry and 228 rushing yards a contest. Little River’s only loss came 46-0 to Central Plains and has matched last year’s win total from a 7-3 year. The Redskins have rushed for 231 yards a game led by sophomore quarterback Graham Stephens (359 pass, 702 rush, 22 total scores accounted for). Little River got a short touchdown pass from Stephens to Bronson Rains with five seconds remaining to beat Moundridge, 48-46, last week. This is the first matchup between the schools in at least 14 years. St. Francis will be a heavy favorite versus the Tigers. Sainty has enjoyed a one-win improvement after a 7-2 year last fall, while the Tigers have climbed two victories. The Indians have lost just one regular season game in the last four years. St. Francis features one of the state’s top QB/RB duos in Brady Dinkel and Jordan Raby for first-year coach Nick Fawcett, who has done an excellent job of improving roster numbers and depth. St. Francis has outscored teams 400-78, while Stockton has scored 234 and permitted 305. Tiger senior Brady Beougher has put together a solid year with 18 scores accounted for in the team’s first seven games. Two teams with polar opposite traditions match up in a marquee first-round game. Wichita County, under first-year coach Brant Douglas, has enjoyed a three-win turnaround and has the most victories since before 2004. Victoria is a longtime state power with four, eight-man championships, a state runner-up and no losing seasons since 1999. Wichita County will have a size advantage led by senior nose guard Jesse Hermosillo (48 tackles, five TFLs). Sophomore Kayde Rietzke has enjoyed a big season with 937 passing, 691 rushing and 33 TDs accounted for. Victoria has plenty of depth with quarterback Cooper Windholz and running backs Jayvon Pruitt and Tyler Knoles. Windholz was banged up some in Week 8. Wichita County has a total margin of 370-124 against the classification’s No. 40 SOS, while Victoria is at 322-189 versus the No. 3 SOS. Victoria has won 10 straight home games. St. Paul looks to capture the same playoff success that carried the Indians to an 8-Man, Division I state runner-up finish a year ago. The Indians have won seven straight games since a season-opening 44-36 loss to Sedan. St. Paul averages 51 points per game on the season led by junior Adam Albertini. Albertini has rushed for 1,553 yards and 34 touchdowns in eight games. Hartford is also a team that can put up a lot of points. The Jaguars won the final playoff spot out of District 2 with a 46-14 victory over Rural Vista last week. Dalen Kistner rushed for two scores and passed for two more scores in the win. Kistner has passed for 1,651 passing yards this season. Marmaton Valley’s three wins came in district play against opponents that are a combined 3-20. Sophomore William Lowder leads the team with 456 rushing yards and five scores, while senior Caiden Elliot has 430 yards and seven scores. Gage Griffith has added more than 300 rushing yards and five scores. Centre has posted a strong season to date with losses only to Canton-Galva (7-1) and Waverly (7-1). The Cougars have scored 400 points this season for a 50 point per game average. Southern Cloud is in the playoffs for the first time since 2013. The Warriors have won three of their past four games and finished district play with a 3-3 record. Carson Bellows and Blake Gumm have been the primary offensive catalysts for the Warriors. Southern Cloud has the ultimate challenge in top-ranked Hanover. The Wildcats have won 33 consecutive games and have posted four shutouts this season. This is a rematch of a non-district game played only three weeks ago. Frankfort won the first meeting, 60-14, behind a huge second half. The Wildcats led 16-14 at halftime, but exploded for 44 points after the break. Garret Dalinghaus rushed for 216 yards and six touchdowns in the Wildcat victory. While Dalinghaus leads the Frankfort team, the same can be said of Kail Dubbert for St. John’s-Tipton. Dubbert has rushed for 775 yards and 14 touchdowns and leads the team in tackles with 131. Sophomore Brayden Perez is the Blujays leading rusher with 856 yards and 12 scores. In the first meeting, Fankfort held BSJT to 183 yards of total offense and forced three turnovers. Altoona-Midway is in the playoffs for the first time since 1992. The Jets qualified as the fourth-place team out of District 1 with a 36-20 win over Colony-Crest. Dayton Marsh rushed for 158 yards and three touchdowns, while Clement Huffman added 70 yards and two scores as the Jets rushed for 330 yards in the win. Waverly is trying to put together one more special season for long-time coach Mike Hevel. Hevel, who has announced his retirement at season’s end, has led the Bulldogs to 190 wins and back-to-back state titles in 2005 and 2006. Waverly’s lone loss came in a 20-0 shutout against undefeated Madison. Quarterback Drew Pyle and running back Jake Newton lead the Bulldog offense. Wakefield (3-5) at Southern Coffey County (5-3) – Southern Coffey Co.
All three of Wakefield’s victories came in district play and were good enough to earn the Bombers’ a third-place finish. After scoring just 26 points in the first three weeks, Wakefield averaged more than 42 points per game in district play. Senior quarterback Skylur Merritt has passed for 826 yards and 12 touchdowns, and added 764 rushing yards and 15 scores. Sophomore Konner Murphy has added 634 rush yards and four touchdowns. Jack Krueger is the team’s leading receiver with 433 yards and six scores. Southern Coffey County has won four of its last five games after starting 1-2. Last week’s 46-36 loss to St. Paul left the Titans with the runner-up finish in District 1. Besides St. Paul, the Titans’ losses have come to Burlingame and Waverly. Senior Dawson Leimkuhler leads the offense with 1,220 rushing yards and 24 touchdowns. Jett Harvey has passed for 836 yards and 13 touchdowns; four of which have gone to Leimkuhler. Kolgan Ohl is the team’s leading receiver with 30 catches for 582 yards and nine scores. Rock Hills will be heavily favored against eight-man newcomer Doniphan West. Injury-plagued Rock Hills dropped out of the top-five early after a big loss at No. 1-ranked Hanover. Senior quarterback Dereck Gillett has played in just three games, while junior Rylee Whelchel has also missed time. Senior Zane Colson, a four-year starter, has exceeded 1,200 rushing yards. Doniphan West has allowed 40 points a game versus the No. 8 strength of schedule in the classification, according to Prep Power Index. Rock Hills, against the No. 47 SOS, has a total score of 295-106. Pike Valley deserves plenty of credit for another winning season under first-year coach Jeremy Miller, who inherited just one returning starter following the retirement of longtime coach Don Melby. Axtell, against the No. 7 SOS, has put up 476 points and permitted just 136 led by its standout QB/WR duo of Quinn Buessing and Hunter Koch. Axtell pushed Hanover in a one-score loss earlier this year. Buessing has passed for 1,840 yards with a 41/2 TD/INT ratio. Axtell defeated Pike Valley, 54-6, earlier this season. Triplains-Brewster has enjoyed a nice turnaround after a 1-17 mark in the last two years. Senior Silas Smith has 122 tackles, while senior Lane Cheatum and sophomore Ryan Hause have each tallied 11 TFLs. Triplains-Brewster has been solid on defense with 32.9 points permitted, and just 23.3 points scored. Osborne, against the No. 4 SOS, has scored 58.5 points a game, third-best in the eight-man ranks, and permitted 22.8. Osborne has three elite playmakers with Darnell and Darrien Holloway and Kade Miller and standout freshman Mason Schurr. Darnell has accounted for 30 scores, Darrien has rushed for 1,000 yards, Miller has eight scores and Schurr has 10. Longtime coaches Ben Labertew (Sylvan-Lucas) and Wallace County’s Kevin Ayers have a combined 37 years head coaching experience. This is the first matchup between the coaches since Ayers’ Wildcats defeated Labertew, then at Natoma, in the 2007 playoffs, 56-8. Both teams have virtually the same defensive numbers. Wallace County has allowed 192 points, Sylvan two fewer. However, Sylvan-Lucas has scored 280 points, 116 more than the Wildcats. Beau Batchman is a top playmaker for the Mustangs, and quarterback Luke Johnson paces Wallace County. Satanta, on the periphery of the top-five in the preseason, has struggled on both sides of the ball with 27.3 points scored and 39 allowed after a 7-2 year in Division I last season. Junior quarterback Houston Friend has accounted for more than 1,000 yards of offense, while senior Gabe Salas has more than 1,330 all-purpose yards and four interceptions. South Barber, with the road tie against Otis-Bison, joins Hanover as one of two Division II teams without a loss this year. South Barber has a three-overtime win versus Hutchinson Central Christian and is one of seven teams to average at least 50 points a contest. Junior Trevor Rooks has passed for 904 yards and rushed for 544 with 32 scores accounted for. This is believed to be the first matchup between the schools. Both teams have enjoyed a two-win improvement from 2017. South Haven has significantly improved its defense to just 34 points allowed a contest after 59.4 permitted last fall and has its most victories since 2013. Stafford, with running back Caleb Hildebrand and quarterback Justice Manning, averaged 20.3 points a game last season and is up to 50.8 this season. Hildebrand has rushed for 719 yards and 19 scores, while Manning has 480 passing and 599 rushing with 26 TDs accounted for. First-year coach Joel Struckhoff, a former Thunder Ridge Shrine Bowler, has enjoyed a big turnaround at his alma mater. The Longhorns won just three games total the three previous seasons. Senior Brandon Grauerholz has enjoyed a big year with more than 1,400 all-purpose yards. Thunder Ridge has a quality win against a Northern Valley squad. The Longhorns have allowed just 27.6 points a game after 48.3 points permitted last year. Dighton, with just five losses in the last three years, has quietly put together an impressive season with just nine players on its roster. The Hornets took competitive losses to Division I top-five teams Hodgeman County and St. Francis and have won six straight. Dighton has allowed 18.5 points a contest. Senior Blair Hoffman has passed for 1,071 yards with a 27/1 TD/INT ratio. He has rushed for 541 yards with seven scores. Northern Valley has posted another solid year despite missing standout offensive players Nick Stutsman and Caden Bach at times this season. Stutsman has thrown for 490 yards with a 7/4 TD/INT ratio and has a team-high 664 rushing yards. Bach has a Husky-best 14 rushing scores. Greeley County earned a key overtime win against Wallace County two weeks ago, the first time the Jackrabbits defeated the Wildcats since 2005. A win would clinch the Jackrabbits’ first .500 or better season since a 6-3 mark in 2010. This is considered to be the first matchup between the schools, according to Kansas Football History. After a 14-point Week 1 loss to Victoria, the Otis-Bison Cougars are 6-0-1 since. The Cougars have had a great defense with 88 points allowed, second-fewest in Division II. Otis-Bison has not lost a home game since Week 3 of the 2016 season. The Cougars feature a bevy of talent led by senior quarterback Anton Foust and senior lineman Luke Higgason. Foust has more than 1,100 total yards. Pretty Prairie took a four-win drop off after a 7-3 mark last fall. Interestingly, this is the second trip to Otis-Bison for Pretty Prairie this year – and first against the Cougars. In the season opener, Pretty Prairie lost, 66-8, against Leoti-Wichita County in a neutral site game at Otis-Bison. For the third straight season, Hutchinson Central Christian leads eight-man football in offense with 492 points. The Cougars have enjoyed strong seasons from quarterback Caleb Lambert (more than 1,600 yards of total offense) and senior Bailey Nachtigal has anchored the line. Ingalls has scored 336 points and permitted 380. Central Christian has permitted 224 points. Barring a deep playoff run, Ingalls will have its first losing season since 2010.